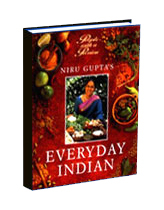 ‘Everyday Indian’, Published by Merehurst, UK, is a menu based book which gives you a good introduction to practical and simple, tried and tested Indian recipes. A good book for a young couple and the non-Indian who has only tasted Indian food but never attempted cooking it—teaches you to cook without mixes and get the right flavour! Roughly chop half the onions and thinly slice the remainder. Finely chop the tomatoes and set aside. Put the chopped onions, diluted tamarind, garlic, salt, sugar, cloves, red chillies, ground cinnamon in a blender or food processor and process until paste forms. Heat the oil in a heavy in a heavy-based saucepan over a medium heat. Add the sliced onions and stir-fry until they turn brown. Stir in the chopped tomatoes and continue stir-frying until the fat separates. Stir in the onion paste and continue stir-frying until the fat separates again. Remove from the heat and leave to cool, then and cover and refrigerate for up to 20 days. Silt the peppers lengthways from one side from the stalk to the tip, to create an opening for the filling. Snip it a little on one side at the broad end to make it easier to fill. Remove the seeds of you do not want these to be too hot. Put the salt, ground dried mango, ground coriander and fennel seeds in a bowl and mix together. Stir in 60 ml (2 fl oz) of the oil. Stuff the peppers with the spice mixture, pressing it in firmly. Heat the remaining oil a heavy-based sauce pan or wok over light heat. When you notice some movement in the oil and its fragrance becomes very strong, add the stuffed peppers. Cook, 5 minutes until the pepper begin to look glossy and slightly cooked. Turn off the heat and leave the peppers and oil to cool. When the peppers and oil are completely cool, transfer them to sterilized, airtight jar, then screw on the lid. The peppers are then ready to eat but they will tenderer and the flavor will mature of you leave them for a few days. Remove the core from the cabbage, then finely shred the leaves. Heat the oil in a heavy-based saucepan or wok over a high heat, then stir in the mustard seeds and dried red chillies. When the seeds splutter, stir in the cabbage and salt and stir-fry for 3 to 4 minutes until the cabbage is just tender. Bring the milk to the boil in a heavy-based sauce-pan over a high heat. Lower the heat to medium and simmer the milk, uncovered, for 30 to 40 minutes until it is thickened and reduced to half the quantity, stirring occasionally so it does not scorch. The color will change to creamy beige and most of the bubbles will be in the center. The wider the pan you use for this step, the quicker it will be. Stir in the sugar, stirring until it dissolves. Bring the milk to the boil again, then lower the heat and simmer, uncovered, for 1 to 2 minutes, stirring occasionally. Stir in the cardamom seeds, them remove the pan from the heat and leave to cool. Meanwhile, finely shred the blanched almonds and the pistachio nuts. When the thickened milk is cool, stir the almonds and pistachio nuts in, reserving a few of each for garnish. Pour the mixture into 8 traditional kulfi moulds or individual freeze-proof containers and freeze until solid. It should take 3 to 4 hours. Remove the mould or the containers from the freezer and use a round-bladed knife to praise out the ice-cream into bowls. 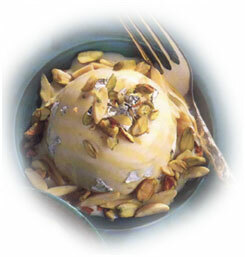 Garnish with silver foil, if desired, and the remaining almonds and pistachio nuts. Serve immediately.